When Lark Books sent out a call for book reviewers for their Jewelry and Beading books, I was so excited to answer - not only am I passionate about jewelry (and beads in particular, of course) but I adore books and reading. I am self taught in many ways, and books have shaped my life. 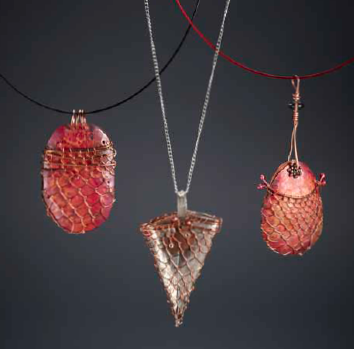 The first book Lark sent to me was a little daunting, due to the fact that I have never worked in metal jewelry at all, but I was transfixed by the images on the cover of Heat, Color, Set & Fire and dove in eagerly. 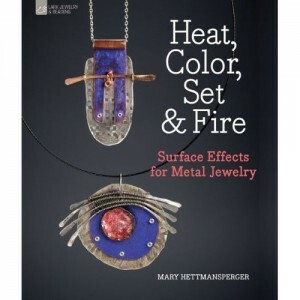 Mary Hettmansperger, a 28 year veteran in fiber and metal arts, has done an excellent job of showing the way in this book, showing the novice techniques such as how to start off by cutting your metals, beginning wire working, cold connections, and riveting, and then taking you by the hand to show you the wonderful textures you can add to bring your materials to life. My favorite part of the book is where she shows you how to use and add color to your metal designs - and even uses colored pencils to gorgeous effect, a method I never would have connected with metals! Mary has a unique, celebratory and primitive style all her own that I really admire. Working with beads, I have found that an organic, free style can be almost harder to achieve than a set, finished and uniform look. She describes her work as being a conversation between materials, techniques and creative desires... I can see all of that in her projects and finished work, and what conversations they are! 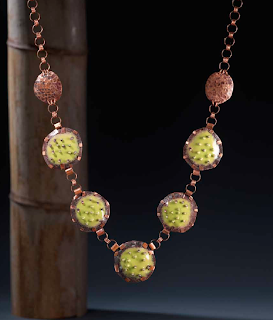 Dots and Loops Necklace and Variations (pg. 56); this project features balling wire, punching, wirework, heat patina and forging, just to name a few techniques. I think the result looks like dragon or fish scales and I love it! The Embossed Pendant & Earrings project (pg. 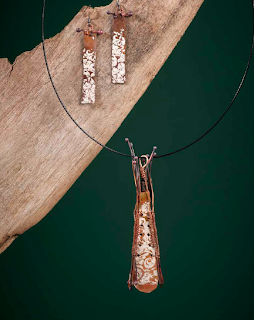 60) uses cutting metal, embossing, stitching and wirework to fabulous effect. Green Enamel Necklace (pg. 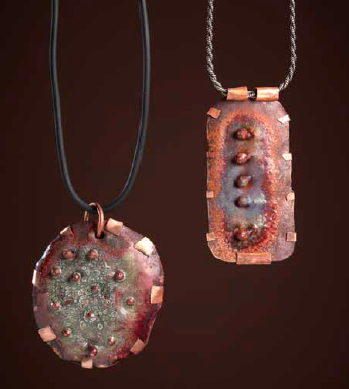 108) shows glorious torch fired heat enameling as well as tab bezeling, and I just love the texture she achieved in this. My all time favorite from this book is the Grout & Silver Pendant (pg. 85) - you have never seen grout look this good!!! The variations show how differently you can make this look, all it takes is your imagination! If you're thinking of turning your hand to metals, or have already started to work with them and want to add color and new techniques to your metals skill set, I highly recommend this book. It is comprehensive and well thought out, and the directions are very clear and well illustrated. My only wish, as someone who has never worked with any metal at all, was that there had been a tiny bit of a glossary of terms in the beginning, as I sometimes had to read on for a little while before I found the definition of several things. Click HERE to take you to the Amazon listing, or read on to the bottom for a chance to win a copy of this fabulous book! You did a great job Nancy!!! The book sounds wonderful. I had initially decided against it, but your review changed my mind. I haven't worked with metal, but the projects make me want to start. :) The tab bezeling looks like fun. I guess I need to track down some copper sheets. Wonderful review! Did you find yourself tempted to try metals? Terrific review, I have all but her latest in my library. 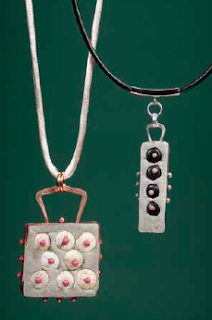 Metalsmith or not her books are inspiring and well written and the pictures are beautiful. This was a wonderful review! It definitely made me want to buy the book, which is impressive because I can be picky about the books I buy. I've done some metalwork in the past. The one thing I'd like to work on is combining my metalwork with my beadwork. 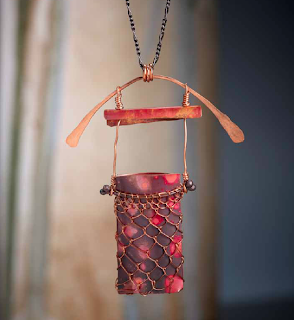 I love the way copper shapes and seed beads look together! Great review, Nancy! thanks for including some of the pics from the book as well as project descriptions. I'm just beginning to play with this type of metalwork. Every time I think about a project, I pick up one of the two books by Mary Hetmansperger that I already own. her books instantly allow me to create fun projects. And my work made using her techniques always sells quickly. Can I just comment that it's a wonderful review and really gives me an idea what I could expect from the book. It looks like a winner - and the photos are fabulous. I love trying out new techniques and different materials. My husband makes jump rings and does chainmaille. I've always been fascinated by metal and glass. 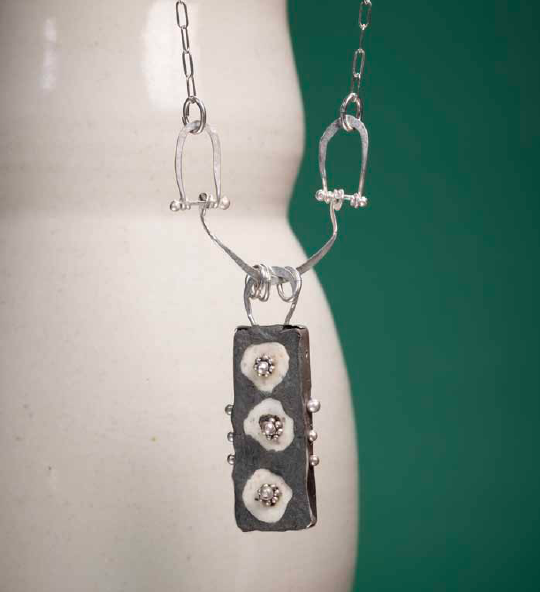 Your review has piqued my interest and renewed the desire to work with metals. I love Mary's work and all her books are fantastic! Your review is great, Nancy. I love my beads but I'm really getting into wire and metals more and more. Mary's books are great for beginners and more advanced students. This book, which I have already, is wonderful because it shows so many ways of applying color to metal which is not something you think of when you think of metal jewelry. I have a large crystal that I want to do using wire work. There are some fascinating pieces that you posted pictures of. Now you make me want it! I like working with fire and metal.